Glaucoma is a group of eye conditions that can damage the optic nerve. This nerve sends the images you see to your brain. 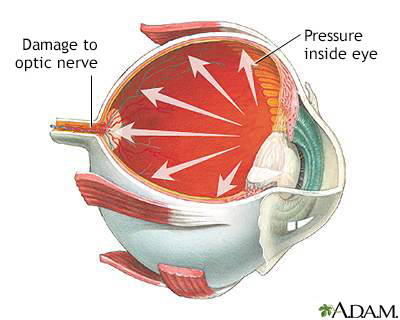 Most often, optic nerve damage is caused by increased pressure in the eye. This is called intraocular pressure. The front part of the eye is filled with a clear fluid called aqueous humor. This fluid is made in an area behind the colored part of the eye (iris). It leaves the eye through channels where the iris and cornea meet. This area is called the anterior chamber angle, or the angle. The cornea is the clear covering on the front of the eye that covers the iris, pupil, and angle. Anything that slows or blocks the flow of this fluid will cause pressure to build up in the eye. In open-angle glaucoma, the increase in pressure is often small and slow. In closed-angle glaucoma, the increase is often high and sudden. Either type can damage the optic nerve. Open-angle glaucoma is the most common type of glaucoma. The cause is unknown. The increase in eye pressure happens slowly over time. You cannot feel it. The increased pressure pushes on the optic nerve. Damage to the optic nerve causes blind spots in your vision. Open-angle glaucoma tends to run in families. Your risk is higher if you have a parent or grandparent with open-angle glaucoma. People of African descent are also at higher risk for this disease. 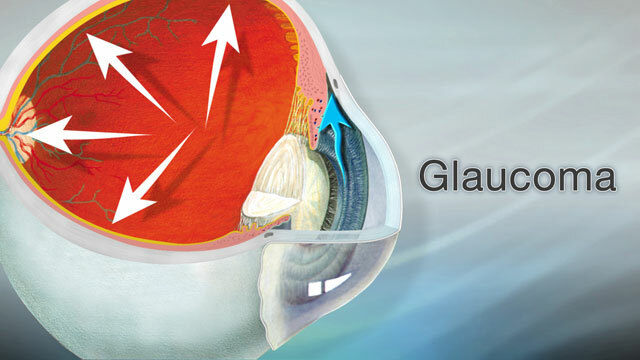 Closed-angle glaucoma occurs when the fluid is suddenly blocked and cannot flow out of the eye. This causes a quick, severe rise in eye pressure. Dilating eye drops and certain medicines may trigger an acute glaucoma attack. Closed-angle glaucoma is an emergency. If you have had acute glaucoma in one eye, you are at risk for it in the second eye. Your health care provider is likely to treat your second eye to prevent a first attack in that eye. Congenital glaucoma occurs in babies. It often runs in families. It is present at birth. It is caused when the eye does not develop normally. Most people have no symptoms. Once you are aware of vision loss, the damage is already severe. Slow loss of side (peripheral) vision (also called tunnel vision). Advanced glaucoma can lead to blindness. Symptoms are most often noticed when the child is a few months old. Symptoms are most often related to the underlying problem causing the glaucoma. Depending on the cause, symptoms may either be like open-angle glaucoma or angle-closure glaucoma. The only way to diagnose glaucoma is by having a complete eye exam. You will be given a test to check your eye pressure. This is called tonometry. In most cases, you will be given eye drops to widen (dilate) your pupil. When your pupil is dilated, your eye doctor will look at the inside of your eye and the optic nerve. Using a special lens to look at the angle of the eye (gonioscopy). Photographs or laser scanning images of the inside of your eye (optic nerve imaging). Laser scanning images of the angle of the eye. Checking your retina -- The retina is the light-sensitive tissue at the back of your eye. Checking how your pupil responds to light (pupillary reflex response). 3-D view of your eye (slit lamp examination). Testing the clearness of your vision (visual acuity). 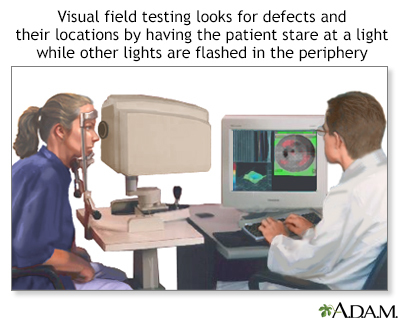 Testing your field of vision (visual field measurement). The goal of treatment is to reduce your eye pressure. Treatment depends on the type of glaucoma that you have. If you have open-angle glaucoma, you will probably be given eye drops. You may need more than one type. Most people can be treated with eye drops. Most of the eye drops used today have fewer side effects than those used in the past. You also may be given pills to lower pressure in the eye. Laser treatment uses a painless laser to open the channels where fluid flows out. If drops and laser treatment do not work, you may need surgery. The doctor will open a new channel so fluid can escape. This will help lower your pressure. Recently, new implants have been developed that can help treat glaucoma in people having cataract surgery. An acute angle-closure attack is a medical emergency. You can become blind in a few days if you are not treated. You may be given drops, pills, and medicine given through a vein (by IV) to lower your eye pressure. Some people also need an emergency operation, called an iridotomy. The doctor uses a laser to open a new channel in the iris. Sometimes this is done with surgery. The new channel relieves the attack and will prevent another attack. To help prevent an attack in the other eye, the same procedure will often be performed on the other eye. This may be done even if it has never had an attack. Congenital glaucoma is almost always treated with surgery. This is done using general anesthesia. This means the child is asleep and feels no pain. If you have secondary glaucoma, treating the cause may help your symptoms go away. Other treatments also may be needed. Open-angle glaucoma cannot be cured. You can manage it and keep your sight by following your provider's directions. Closed-angle glaucoma is a medical emergency. You need treatment right away to save your vision. Babies with congenital glaucoma usually do well when surgery is done early. How you do with secondary glaucoma depends on what is causing the condition. 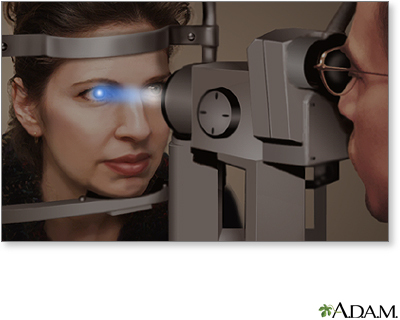 If you have severe eye pain or a sudden loss of vision, get immediate medical help. These may be signs of closed-angle glaucoma. You cannot prevent open-angle glaucoma. Most people have no symptoms. But you can help prevent vision loss. You should have regular eye exams as recommended by your provider. Gross RL, McMillian BD. Current medical management of glaucoma. In: Yanoff M, Duker JS, eds. Ophthalmology. 5th ed. Philadelphia, PA: Elsevier; 2019:chap 10.24. Heijl A. Glaucoma treatment: by the highest level of evidence. Lancet. 2015;385(9975):1264-1266. PMID: 25533655 www.ncbi.nlm.nih.gov/pubmed/25533655. Madu A, Rhee DJ. Which therapy to use in glaucoma. In: Yanoff M, Duker JS, eds. Ophthalmology. 5th ed. Philadelphia, PA: Elsevier; 2019:chap 10.23. Moyer VA; US Preventive Services Task Force. Screening for glaucoma: US Preventive Services Task Force Recommendation Statement. Ann Intern Med. 2013;159(7):484-489. PMID: 24325017 www.ncbi.nlm.nih.gov/pubmed/24325017. Prum BE Jr, Lim MC, Mansberger SL, et al. Primary open-angle glaucoma suspect preferred practice pattern guidelines. Ophthalmology. 2016;123(1):P112-P151. PMID: 26581560 www.ncbi.nlm.nih.gov/pubmed/26581560.